One-point perspective is fairly simple and straightforward. 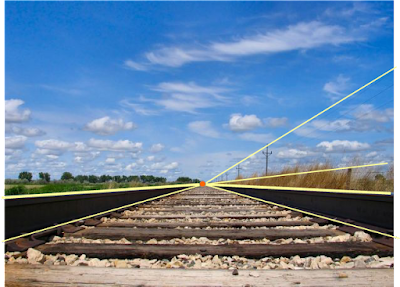 You have a horizon line (HL or EL--eye level) and one point (VP--vanishing point) on that line. All the parallel lines converge on this point, as illustrated above. Now let's look at the same drawing with all its parts. The blue line is the horizon, the yellow lines are converging and the red dot is the vanishing point. Also notice that everything closer to you has more detail, whereas those objects further away become less distinct. The photo below is a very dramatic example of how everything goes to a point in the distance. I just love this picture. The photographer has truly captured that zooming feeling. Observe how the ties, rails and rock are so detailed immediately in front of us. 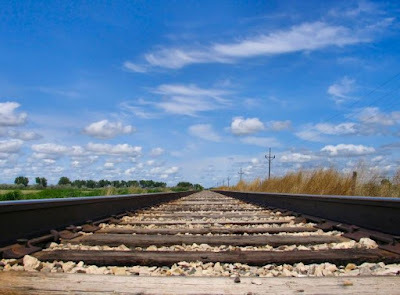 Then move your eye further down the track and suddenly everything gets smaller and narrower--even the telephone poles. Also notice how the clouds nearest you are larger, while those in the distance get smaller. Believe it or not, drawing clouds using one-point perspective can be very, very helpful. 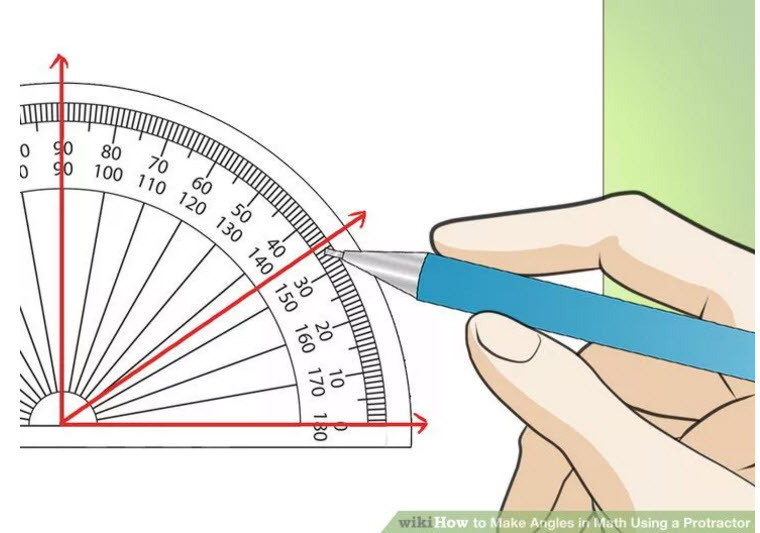 See how the lines all go toward the point in red. 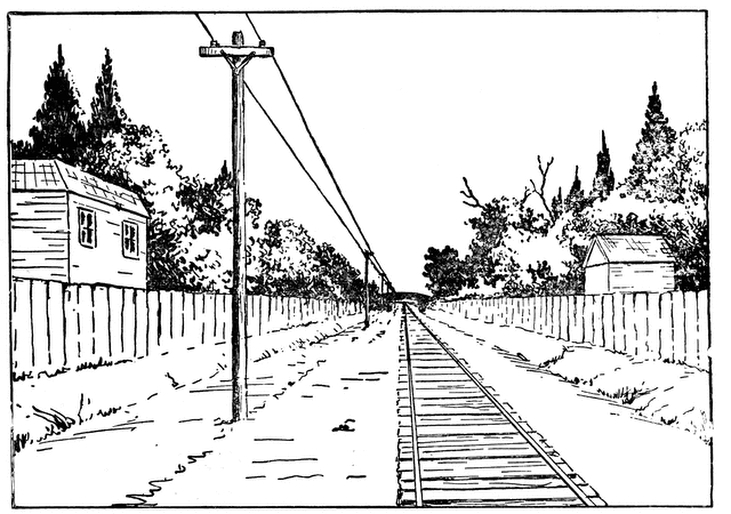 More importantly, you can do so much with one-point perspective other than just railroad tracks. Check out all of these other examples. 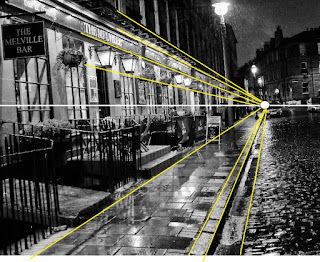 Observe how all the yellow lines converge to the white vanishing point. 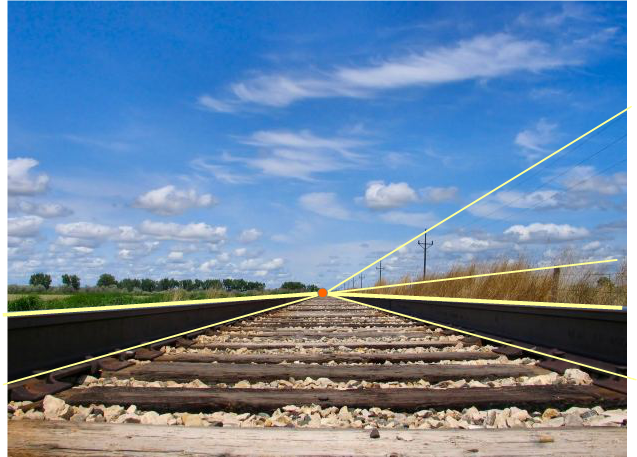 By the way, when you determine where the vanishing point is located, you have actually found the horizon line (white horizontal line). Can you see how this photo is in one-perspective? In this photo, you can see that the pears are receding in the distance--although not that far away. But what else can you see? The horizon line and vanishing point are off the edge of the photo. This happens a lot. So how can you determine where the lines are going and where the vanishing point is located? 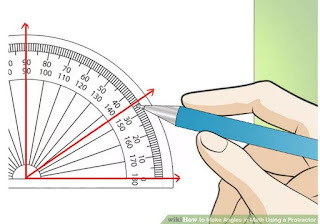 When it comes to still life or outdoor sketching, I use a protractor to determine my angles. It's a great little tool, especially if it comes with an arm. 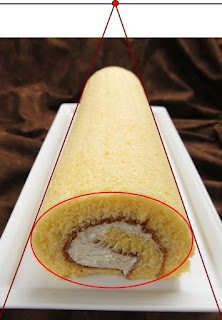 Below is another example of one-point perspective but this time with a rolled cake. As I said, we're not limited to just structures and buildings when exploring perspective.Again the horizon line is above the cake. But why bother even finding the perspective? Is it really necessary. Yes, it is. For one, it will help you create a better picture. How many times have you looked at a painting or a drawing and known things weren't right? Often it's because the perspective is off. But there is another reason. I like to set up the lines to serve as a grid for me. I can visualize right off how all the elements fit together. 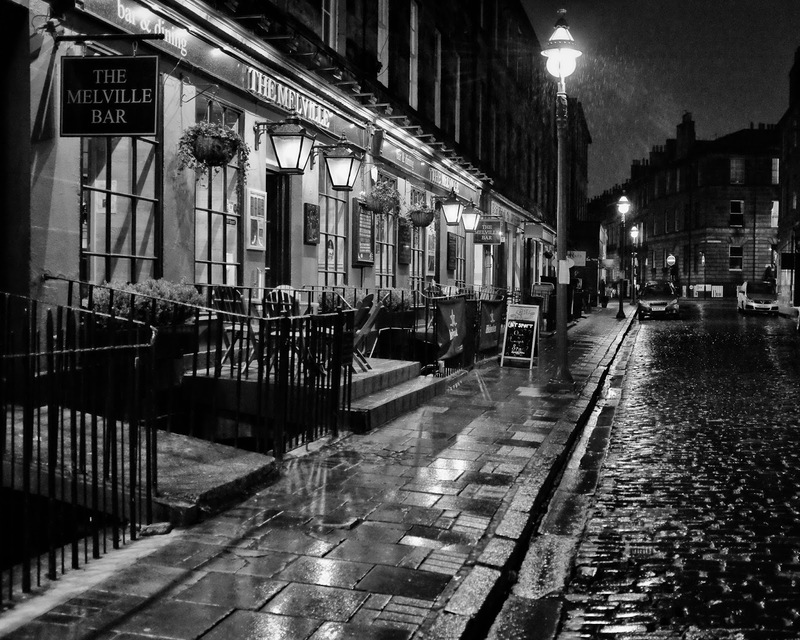 For example, let's review that city photo again. 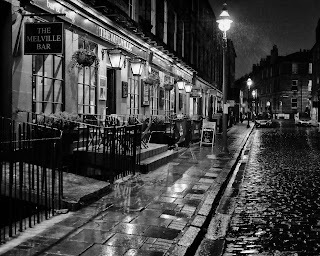 Everything is in line with everything else and most importantly, objects are more detailed and larger further away from vanishing point. All I have to do is pay attention to the vertical lines to help me create the building, lamps, windows and so on. 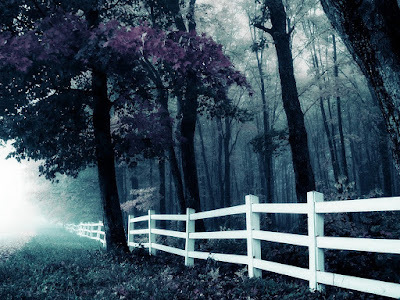 Things seem simple enough, but there are some challenges to one-point perspective and that's the distance between objects that are next to each other, such as with a fence. See the fence below? By now it should be easy to establish the convergent and horizon line, along with the vanishing point, but notice how the space between each post gets smaller into the distance. Although it's fairly easy to draw, it can be tricky. Learn how in our October issue. There is a $50 deposit to reserve your place. Limited to six students per class. See www.jillgoodell.com for details on any of the studio classes. The Saturday workshops at PCC are usually held at the Sylvania campus from 10 a.m. to 4 p.m. Please contact PCC for details: call 971-722-6266 or visit their website at: www.pcc.edu/community. Please note: Workshops fill up early.